With funding from U.S. DOE’s SunShot program, the University of California, San Diego appears to have developed a revolutionary type of nanoparticle-based solar cell that can achieve a 90% efficiency. Considering that billions of dollars are wasted annually disposing of radioisotopes produced by nuclear power plants, the term radioactive waste fits the industry like a glove. As more resources are invested, more waste is produced as urgent issues concerning safety and the environment are pushed to the backburner. In the midst of this unstable situation, however, research continues to grow slowly but surely towards harvesting one of the freest and safest sources of energy available to all: the Sun. Since energy can neither be created nor destroyed, and must be conserved at all times, sunlight can turn into electricity with the proper converting mechanism. This isn’t magic. It’s basic physics. Solar cells have never been extremely efficient. Photo: Reported timeline of solar cell energy conversion efficiencies (courtesy of National Renewable Energy Laboratory). So far solar cells, made out of a variety of semi-conductors such as crystalline silicon, are promising but not (relatively) that efficient. They can’t reach very high temperatures, and require maintenance every year. But there is no cause for despair. Funded by the U.S. Department of Energy’s SunShot program, the University of California, San Diego appears to have developed a revolutionary type of nanoparticle-based solar cell that can achieve a 90% efficiency. 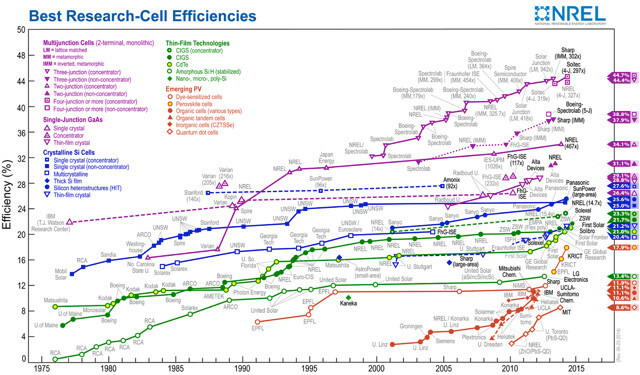 The efficiency of solar cells has been on the rise since the 1970s. In 2013, a new record of 44.7% was established by the German Fraunhofer Institute for Solar Energy Systems. Today numbers in 2014 have climbed into the 90% range, starting with UC’s promising team composed of graduate students in materials science and engineering, Justin Taekyoung Kim, Bryan VanSaders, and Jaeyun Moon. The team’s research, published in Nano Energy, takes advantage of an emerging technology known as CSP (Concentrating Solar Power). This technology is analogous to focusing light beams using a magnifying lens. In this case, CSP power plants use concentrated sunlight to heat molten salt, which in turn create steam that sets giant turbines in motion and generates electricity– similar to how fossil fuel plants function. Additionally, CSP’s ability to store energy overnight in thermal storage tanks is a monumental leap away from traditional methods that cease energy production with the arrival of nighttime. In classical mechanics, a perfect black body absorbs all electromagnetic radiation (including visible light) and reflects none. CSP systems are usually designed with 100,000 mirrors that capture and reflect sunlight towards black-painted material towers. This minimizes loss of energy due to infrared radiation, as well as maximizes the absorption of sunlight. Unfortunately, typical CSP plants are shut down yearly for maintenance as new coating is applied and cured on the towers. This is why UC’s research is so unique. 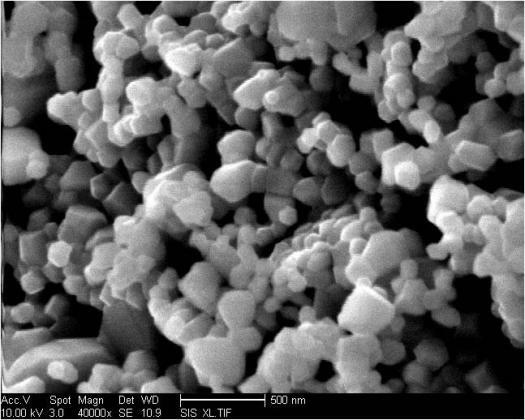 The team has synthesized a new nanoshell material unlike any others. Not only can it withstand temperatures reaching 700° Celcius, granting it an efficiency of 90%, but its robust design also entails a significantly longer life cycle in spite of constant exposure to weather conditions. Hopefully burying nuclear waste in our own backyards will soon become a thing of the past, starting in the state of California. Source: University of California – San Diego. New solar power material converts 90 percent of captured light into heat. Press Release. What is the best place to find solar news? Tesla Introduces New Solar Roof Tiles, But What Exactly Are They?